You'll be £25.00 closer to your next £10.00 credit when you purchase Walking the Western Front. What's this? The Walking the Western Front series started in 2012 with the release of two films on the Ypres Salient. Directed by acclaimed film maker Ed Skelding with guest historian Nigel Cave, the series of films offered a detailed tour of the battlefields, exploring the skirmishes originally fought there as well as calling on Nigel’s high level of expertise. The duo also visited a number of war cemeteries and famous locations on the battlefields. This book, brought to you by the same team, is aimed as a companion to the DVD series and explores the history of the battlefields through the eyes of the camera team. 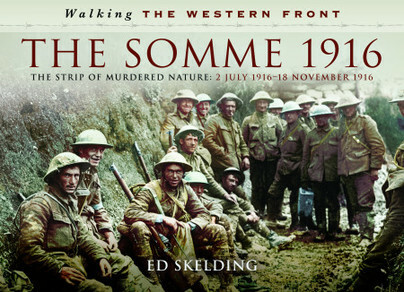 Complete with 150 prints, both in colour and black and white taken over a twenty year period reflecting the authors many filming trips to the Somme, the book shows the battlefield as it was almost 100 years ago and is accompanied by a shot of the exact same spot as it stands today. The author then explains the significance of the photographs and why they were included in both the book and the film. Battleground historian Nigel Cave will also contribute to proceedings and add his expert knowledge to the narrative. While researching the battlefields, the author has taken many photographs with the intention of selecting locations for filming. Each has been carefully chosen to maintain the narrative and, as much as possible, to put the viewer/reader on the spot where the action took place. As the centenary of the start of the Great War approaches, these films and books are designed to follow on from the success of Great Battles of the Great War as more people visit the battlefields. While this book will take the reader to the most recognised locations on the Somme, it will also take them to the places less well known, off the beaten track. Ed Skelding is a film-maker with more than twenty World War One broadcast documentaries to his credit. These include the series made for ITV - Great Battles of the Great War, which resulted in the book of the same name for Pen & Sword with author Michael Stedman.